I have lived in Mumbai for almost 23 years of my life and like any other Mumbaikar am a total sucker for Vada Pav, Misal Pav, Ussal Pav, Dhabeli, and Pav Bhaji. I have had tried several recipes for making pav (bread, also known as laadi paav) bhaji (healthy vegetable mash with aromatic spices), but none of them have come this close to match the flavours and aroma of a busy Mumbai street "Pav Bhaji Thelawala" (hawker selling Pav Bhaji on a cart, typically outside railway stations, parks or right on the beach). I have done some improvisation here to make the recipe as authentic and flavourful as possible. Hope you like the recipe as much as I loved cooking. Heat a large pan, throw in tomatoes, potato, green peas, capsicum, green chillies and cauliflower. Add 1 tsp of kashmiri chilly powder, 1 tbsp of ginger garlic paste, turmeric powder, ¼ of the butter. Add little water to cook the veggies on a medium heat. With the help of a masher, keep mashing the vegetables. You can add some water if the mixture gets too dry. Once the vegetables in the mash are almost unrecognizable, add ½ tbsp of pav bhaji masala, salt to taste and ½ of the chopped coriander leaves. Mix thoroughly, continue to mash them. Once the mixture is totally mashed, lower the heat. Heat the remaining butter in a pan, lower the flame, add ¾ of the chopped onion, 1 ½ tsp of kashmiri chilly powder, 1 tbsp ginger garlic paste, ½ tbsp of pav bhaji masala, kasuri methi, asafoetida, ¾ of the remaining chopped coriander leaves, lemon juice. Though I have avoided adding color, you can add red food color to the mixture (bhaji on the street shops add color to get the definitive red bhaji). Saute for few seconds and then add this mixture to the vegetable mash. Cook the mash for a minute or two and we are done. Now, lets assemble. Slit open the batch of 4-5 paav from the middle, in a hot pan, add a butter, pinch of pav bhaji masala, sprinkle a little coriander leaves. Place the pav over the butter mixture and toast them lightly on both sides. Garnish bhaji with remaining chopped onion and coriander, serve with the toasted buttery pav and a wedge of lemon. 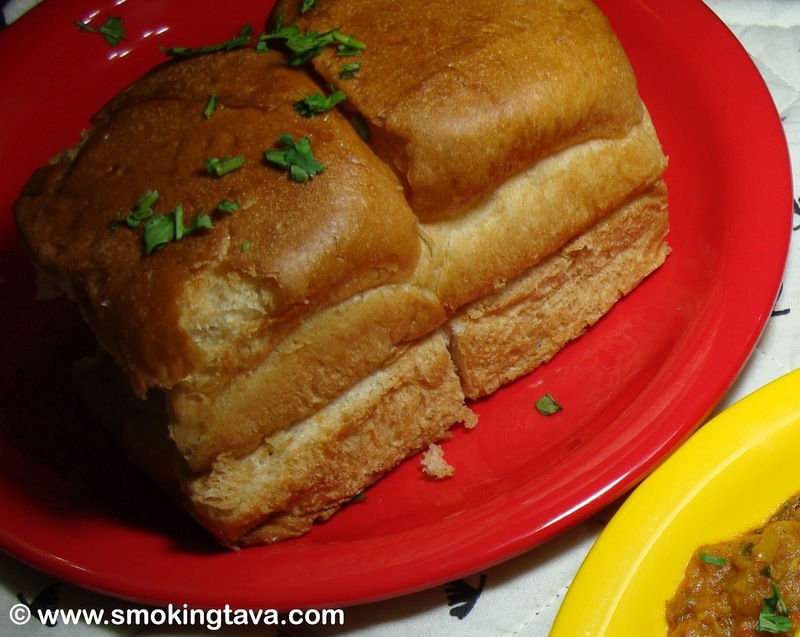 Enjoy the mouthwatering pav bhaji. Please leave your comments, they inspire me to carry on.